SonyEricsson tried to fill a niche of entry-level phones, producing a new model T100, the price of which will be about 100 USD. However, the features of the phone are not so simple as we can expect from the entry-level phone. Firstly, the dimensions of the phone are only 99 x 43.5 x 17.7 mm and it weighs 75g., it's not much. Secondly, the phone has a lithium-ion battery, what is not typical for the phones of this class. These facts show that the other model was used as a base of T100. T600 is a leading contender for that. See yourself. The phone is produced in three colours: Icy Blue, Gentle Gold and Fresh White. We had a Gentle Gold phone as a test sample. Only the colours of a rim around the screen and sides of the phone are different, the other part of the phone is made of white plastic. The sides of the phone are made of rubber or a plastic that has the similar features. As a result the phone doesn't slide in hands. There is a volume key on the left-hands side of the phone. While pressing it you can also see time, date and a selected profile. A screen has a blue backlighting, it can display up to 4 text lines (18 characters each), one line with icons and tips to the soft-keys use. This display is similar to one that T600 has, the only exception is the colour of backlighting. The information is clearly visible on the screen but it seems to me that the backlighting is darkish. Keys backlighting goes well to the phone colour, we had orange or gold keys backlighting in out test-sample. All the keys are made of plastic. Functional keys are united under the screen. Such order resembles design from Sony. It's not very convenient to use the keypad. Five functional keys are positioned too closely to each other, but the problem is that the keys are too deeply placed in the phone. Alphanumerical keys are handier but they positioned too far from each other and it's not comfortable to dial a number. Keys symbols are highly visible in the dark and in the average lighting conditions but not in bright light. 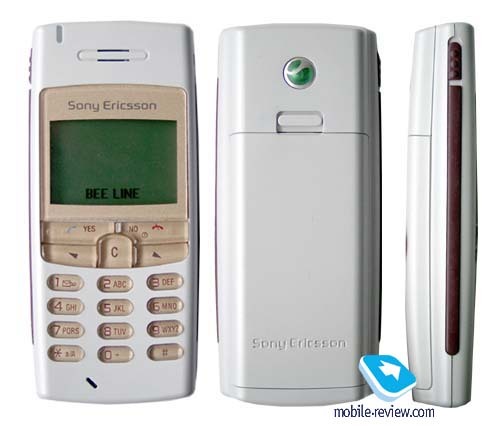 A battery of the phone is similar to the one in T600. According to the manufacturers T100 can work up to 200 hours in the standby mode and up to 4.5 hours in the talk mode. In practice the phone worked about 3 days (MTS Network) in case of 30 minutes of talking and 2 hours of using other functions (games, alarm-clock, calendar). The time of charging is about 3 hours. One more detail: the battery also servers as a rear part of the phone. Unfortunately it has a horizontal backlash. Sometimes the phone can scratch what is rather disappointing. So, we see that T100 is similar to T600 by the screen type (its resolution), dimensions and weight. Slight changes of dimension and weight are connected with different battery construction and different keypad. A decision to refuse from the handy keypad of T600 can be explained by a marketing policy. T600 and T100 are the phones of different categories and the price of the handsets is considerably different. It is another evidence that T100 is an ODM-product. By the way, compare side keys of the phones. Do you see any difference? All the features of the new model resemble the features of T600, which, in turn, is an edited version of T66. Naturally, T100 is most likely an analogue of T66 than T600. It doesn't have neither the third band nor HSCSD. Menu organization is traditional for the phones from Ericsson. The main menu is represented by bookmarks with tips. Press any arrow key to open it. There is a shortcut number navigation to access the menu items quickly. One of the menu peculiarities is that you can add your favourite functions to Shortcuts. Later to access this menu you need only press a menu key. C key has one function, it brings the phone to silent mode. By the way, let's turn on to the menu items description. Phonebook. Phonebook is rather simple here. Up to 100 phone numbers can be stored here, SIM-card memory is also available. A search by name and cell location can be used. There is a speed dialing for the first 8 numbers (2-9). You can create caller groups, it is possible to associate special ringing tones to up to 10 names. You can also add e-mail addresses to up to 10 names. Here is all about possibilities offered by this phonebook, but a common user doesn't need more. Messages. There are 10 templates, broad cast settings, a possibility to create a group message and EMS support, which doesn't work properly because of the old version. You can also send and receive concatenated (long) messages. Call info. Traditionally, call lists are kept in this menu. There is one list with information about missed calls (up to 10 phone numbers) and the second list with incoming and outgoing calls (up to 20 phone numbers) with time and date indication. You can also view the duration of received and dialed calls and the last call. Settings. An access to the main menu features is placed here. You can select one of 15 pre-default ringing tones, which can be used as an incoming alert. If you are not satisfied with them you can compose your own melody (up to 10) in the integrated editor. A vibrating, messages and alarm clock alert are set here too (any pre-default ringing tone). You can also turn on a minute minder, which will warn you about the coming minute. Profiles help you to personalize the phone according to your tastes. Extra. One can find an organizer here. It has a weekly and daily view. To enter a specific day press a menu key and choose a day from the list. A temporary table with all events is displayed while viewing. The screen is not big and only minimum information is displayed, so you need to use scrolling. You can add several types of events (Meeting, Call, Reminder and Task), set a warning alert and an actual time. I think that a usual alarm clock is more interesting to the common user. It can be set for a once or recurrent alert (for example, it can work only in special days of the week). An alarm clock can alert even when the phone is turned off. Besides, the phone has a countdown timer, a stopwatch with the capability to show intermediate results and a calculator. Pre-loaded games are the following: Yukon Struggle (a kind of patience), Ballpop (a kind of Arachnoids), Naval Fleet, Q (a good logical game) and Wuzigi. WAP. WAP-browser in version 1.2.1 is installed here. The only conclusion that we can make after testing is that T100 is the same phone as T66 and T600, it has almost the same features. As a result there are no any problems with quality connection and the ring volume. A vibrating alert is weaker because of the new phone construction. You don't feel it sometimes. The melodies are not varied greatly but you can create your own ones. Here you can listen to the standard ringing tones (mp3, 240 Kb). Negative point is an inconvenient keypad, positive sides are minor dimensions and a good battery type. We think that T100 became a successful model in the entry class. A manufacturer promised that the price would be 100-120 USD. Believe, T100 is really a good choice for such money. The problem is that this phone is would be in demand which couldn't be satisfied in all countries. So, most likely there wouldn't be big lots in some countries, including Russia, and the price could be 170-180 USD there. It's not reasonable to purchase the phone in that case, it's better to wait a little bit. The second conclusion is not obvious. Probably T600 wouldn't withstand a competition with T100 and would be taken out of production. We think that the other model with more advanced features, small dimensions and larger screen will be manufactured as a substitution of T600. But it would be only in the beginning of the next year.